Harrison Assessments measures the strengths and challenges of behavioral tendencies with ONE self-assessment. Coaches, advisors and support staff gain the ability to help students truly get to know themselves and provide a dialogue in order to drive new levels of meaningful connection and change. The online assessment, which takes less than 30 minutes to complete, measures 175 factors including task preferences, motivations, work environment preferences, interests, and interpersonal preferences. The data collected generates a multitude of reports which are invaluable to students as they focus on becoming more self-aware and developing toward a fulfilling life and career. The coaching process enables students to participate as collaborators, deepening their awareness and ability to articulate their story to prospective employers. The potential for transformation as a college student is ignited as scripts are updated and they proactively navigate the territory between graduation and gainful employment with more skill, confidence and purpose. Individual narrative-based coaching sessions have been designed to help the coach/advisor meaningfully connect with the student. Each session corresponds with a specific Harrison Assessment Report. The reality is that most students want to create a bigger future, but don’t know how to. Today, students come to a college campus at 18 years old and think their ticket to a substantial career is created by being eligible for the position which they have been told is a college degree. What most learn along the way is that it’s just as much (if not more) about suitability (their behavior) and the relationships they create. It’s the coach/advisors job to help the student unpack their script, embrace the things that they have learned from their script and write a new script about a bigger future. The coach/advisor facilitates discussion about the students’ desired future so that they can document action steps resulting in personal change. The Harrison Assessments higher education model is a turnkey solution to easily enable educators to assess, develop and evolve their students. You’ll receive access to the Harrison Assessments Career Planning System with the ability to generate individual or multiple reports for each student on an as needed basis. It’s a pay as you go system. We’ll train you to use the system and the reports with your students. You’ll also have access to all the materials you will need to deliver the program to your students, including the technology, narrative-based coaching sessions and feedback resources. Together we’ll help your students on their journey towards gainful employment! Students will uncover their top 5 Life Themes – the areas that will naturally drive them. These life themes will provide the student will clarity about their life purpose and the areas they value most. Understanding these life themes will influence their life and career. The Harrison Assessments Traits & Definitions Analysis provides a stack ranked inventory of the student’s interests, strengths, engagement factors, work preferences, task preferences, environment preferences and competencies, providing insight to pursue a career that aligns with their life purpose. Students will uncover the keywords that describe who they are. Understanding the characteristics, strengths and traits that describe who you are is a great step toward being able to create and articulate your personal brand. 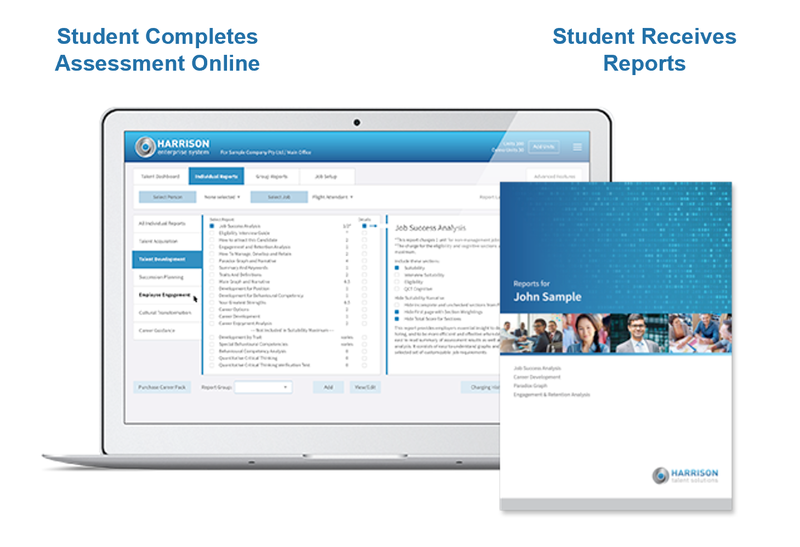 The Harrison Assessments Summary & Keyword Analysis will enable students to be able to describe themselves and gain personal insights into their attitudes and behaviors. This report gives the coach/advisor the opportunity to help the student reflect on their strongest characteristics. This gives the student the opportunity to put language together that articulates their beliefs and characteristics which will help them communicate their uniqueness and build and refine their personal brand. Students will uncover what they are naturally great at – their unique strengths. Becoming self-aware of their highest priorities and values and what they love doing most will enable students to further build on their key strengths. The Harrison Assessments Greatest Strengths Analysis will assist students with their personal branding and prepare them to clearly articulate how their uniqueness will create value for organizations of potential employers. This report provides the strengths that the student possesses, meaning they are things the student enjoys and is probably good at. Student will uncover how well they recognize, understand and manage their own emotions and the emotions of others. Students will be able to use this blueprint to relate better to other people, form healthier relationships, achieve greater success at work and lead a more fulfilling life. The Harrison Assessments Emotional Intelligence Analysis will enable students to capture a snapshot of their existing levels of emotional intelligence, including knowing oneself, relationship leadership, self-motivation/self-management and social awareness/service orientation. Students will uncover what they will find most enjoyable, what’s important to them in a career, how they interact with others, their interpersonal skills, what motivates them, how they approach decision-making and their leadership potential. The Harrison Assessments Career Development Analysis Report will enable students to leverage who they are, identify areas for development and seek employment with a likelihood of success. Students will uncover which careers they would most likely enjoy, those that will provide the greatest job satisfaction and the necessary degrees they should consider for success in their chosen career path. The Harrison Assessments Career Options Analysis stack ranks a student’s enjoyment percentage and suitability to the requirements of more than 650 careers, providing a road-map to navigate the world of work and self-manage the career building process.